Village of Campania, Italy, about thirty miles from Rome. 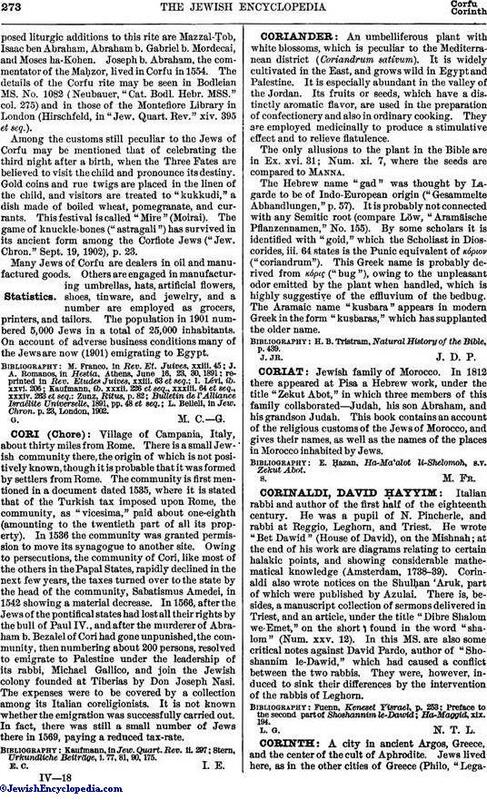 There is a small Jewish community there, the origin of which is not positively known, though it is probable that it was formed by settlers from Rome. The community is first mentioned in a document dated 1535, where it is stated that of the Turkish tax imposed upon Rome, the community, as "vicesima," paid about one-eighth (amounting to the twentieth part of all its property). In 1536 the community was granted permission to move its synagogue to another site. Owing to persecutions, the community of Cori, like most of the others in the Papal States, rapidly declined in the next few years, the taxes turned over to the state by the head of the community, Sabatismus Amedei, in 1542 showing a material decrease. In 1566, after the Jews of the pontifical states had lost all their rights by the bull of Paul IV., and after the murderer of Abraham b. Bezalel of Cori had gone unpunished, the community, then numbering about 200 persons, resolved to emigrate to Palestine under the leadership of its rabbi, Michael Gallico, and join the Jewish colony founded at Tiberias by Don Joseph Nasi. The expenses were to be covered by a collection among its Italian coreligionists. It is not known whether the emigration was successfully carried out. In fact, there was still a small number of Jews there in 1569, paying a reduced tax-rate. Stern, Urkundliche Beiträge, i. 77, 81, 90, 175.